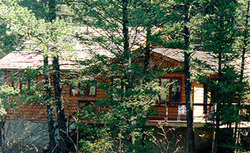 The Trout Club cabins are located 20 miles from Bozeman in the Gallatin Canyon. We are centrally located for Yellowstone Park, Big Sky and Bridger Bowl ski areas, the Lewis and Clark Caverns, the dinosaur museum, river rafting, horseback, hunting and sight-seeing. We own half-mile of private Gallatin River frontage for fishing. A River Runs Through It was filmed just three miles upstream from our completely furnished cabins with kitchens and washer/dryers. We supply all bed and bath linens, silverware, dishes and pots and pans. The Rainbow Cabin will sleep up to eight people. The Cutthroat Cabin sleeps six. Annie's Cabin sleeps two in a double bed. Each cabin has a TV monitor and VCR. We stock each cabin with about 30 feature films on video cassette. Call 323-939-8156 for brochure and for additional information and photos, go to http://www.memorysite.com/gallatin. Directions: To find The Trout Club, leave from the Bozeman airport, drive south on highway 191 toward Yellowstone Park. Just 30 yards before the concrete bridge over the Gallatin River that is located at the beginning of the Gallatin Canyon, turn off onto the gravel road to your left. Drive through the metal gate and along side the river for one mile. It's 20 miles and should take you about 30 minutes.